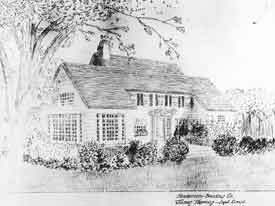 Architectural rendering of McLean House from the period of its construction. Dr. Edward McLean built the McLean house in 1927 for his family. Dr. McLean and his wife Anne helped design and build this lovely modified colonial style, three-story home to suit the needs of their growing family. It included seventeen rooms, a full basement and attic, two fireplaces, and three full baths. The home was built with the finest craftsmanship the 1920’s had to offer, including handcrafted woodwork, sculptured wallpaper, charming fixtures, spacious bedrooms, a sun drenched conservatory and a complete kitchen. The main stairway, including balustrade, doors, windows, sills, and all moldings are of native walnut.